The next generation neutrino observatory proposed by the LBNO collaboration will address fundamental questions in particle and astroparticle physics. The experiment consists of a far detector, in its first stage a 20 kt LAr double phase TPC and a magnetised iron calorimeter, situated at 2300 km from CERN and a near detector based on a highpressure argon gas TPC. The long baseline provides a unique opportunity to study neutrino flavour oscillations over their 1st and 2nd oscillation maxima exploring the L/E behaviour, and distinguishing effects arising from δ CP and matter. 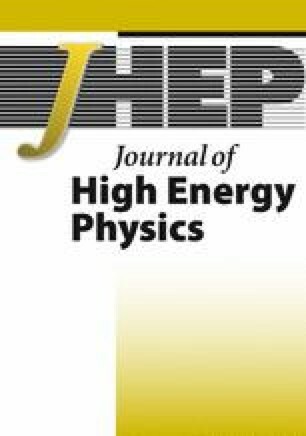 In this paper we have reevaluated the physics potential of this setup for determining the mass hierarchy (MH) and discovering CP-violation (CPV), using a conventional neutrino beam from the CERN SPS with a power of 750 kW. We use conservative assumptions on the knowledge of oscillation parameter priors and systematic uncertainties. The impact of each systematic error and the precision of oscillation prior is shown. We demonstrate that the first stage of LBNO can determine unambiguously the MH to > 5σ C.L. over the whole phase space. We show that the statistical treatment of the experiment is of very high importance, resulting in the conclusion that LBNO has ~ 100% probability to determine the MH in at most 4-5 years of running. Since the knowledge of MH is indispensable to extract δ CP from the data, the first LBNO phase can convincingly give evidence for CPV on the 3σ C.L. using today’s knowledge on oscillation parameters and realistic assumptions on the systematic uncertainties. A. Stahl et al., Expression of Interest for a very Longc Baseline Neutrino Oscillation experiment (LBNO), CERN-SPSC-2012-021 (2012). F. Piquemal, Reactor neutrinos, double beta and beta decays experimental review, PoS(ICHEP 2010)553. LBNE collaboration, C. Adams et al., Scientific opportunities with the long-baseline neutrino experiment, arXiv:1307.7335 [INSPIRE]. A. Rubbia, A CERN-based high-intensity high-energy proton source for long baseline neutrino oscillation experiments with next-generation large underground detectors for proton decay searches and neutrino physics and astrophysics, arXiv:1003.1921 [INSPIRE]. E. Shaposhnikova et al., Recent intensity increase in the CERN accelerator chain, CERN-AB-2005-029 (2005). B. Goddard et al., Chamonix 2012 workshop on LHC performance, CERN-ATS-2012-069 (2012). V. Papadimitriou, Status of the LBNE Neutrino Beamline, arXiv:1112.0720 [INSPIRE]. IceCube, PINGU collaboration, M. Aartsen et al., PINGU sensitivity to the neutrino mass hierarchy, arXiv:1306.5846 [INSPIRE]. A. Balantekin et al., Neutrino mass hierarchy determination and other physics potential of medium-baseline reactor neutrino oscillation experiments, arXiv:1307.7419 [INSPIRE]. NOvA collaboration, D. Ayres et al., NOvA: Proposal to build a 30 kiloton off-axis detector to study ν μ → ν e oscillations in the NuMI beamline, hep-ex/0503053 [INSPIRE].